My photo album about pelmeni, a quirky Russian food. Recipes, secrets and lots of stuff you won't find anywhere else, available on paper or as an e-book. This is a no-nonsense instruction on how to cook pelmeni — the unique and delicious Russian dumplings — using very simple ingredients. The book provides step-by-step instructions with photos of each step, as well as tips and tricks to make the dish stunningly good and tasty. For professional and amateur cooks. This is the perfect recipe book for a Saturday evening dinner with friends! 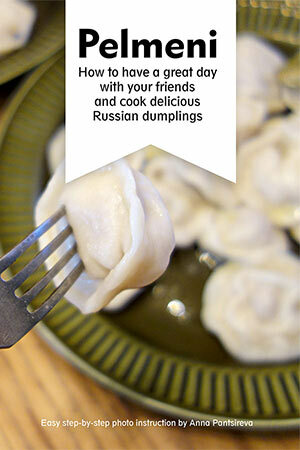 It's written in a very friendly and easy style and the pelmeni turned out delicious. I highly recommend this dinner for a family party or celebration with friends as you can get everyone involved in making the dumplings. The ingredients are very simple and inexpensive.